We'll sadly have to wait until 2014 before we get to see the latest feature from writer/director Wes Anderson, the Ernst Lubitsch-inspired The Grand Budapest Hotel, but this week we're getting some early treats. IMDb has debuted the first poster for the new movie, and a trailer is set to premiere later this week. 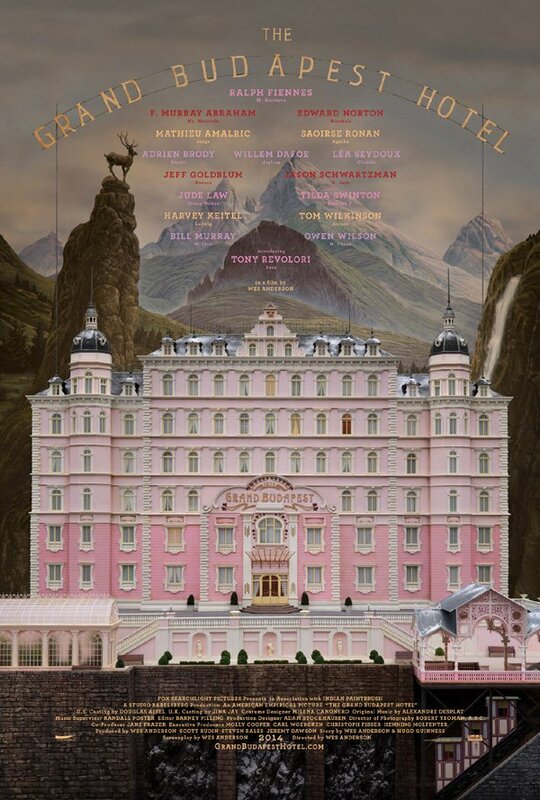 What I really love about this poster is just how perfectly Wes Anderson it is. This isn't simply an illustration or photograph of the Grand Budapest Hotel, but rather what appears to be minature model sitting in front of a matte painting (featuring one seriously majestic looking deer). It's easier to see in the high-res version of the poster - which you can see right HERE - but it's clear that the title at the top of the poster is actually held up by the thin wire that comes from the roof of the building. Absolutely fun and beautiful work is on display here. Anderson fans will recognize that this cast is absolutely packed with stars who have worked with the writer/director before. In fact, less than half of this list is made up of actors who are only working with the filmmaker for the first time. Hopefully they enjoyed the production experience enough so that they will all remain options for future projects.